As more details emerge today of Edinburgh council plans to cut £141 million over four years, UNISON’s Edinburgh Branch is calling on the council’s ruling capital coalition to stand by the promises of no compulsory redundancies and no privatisation that they were elected upon. The figures UNISON released yesterday of £141 million in cuts have been confirmed and while the council claims 2,000 jobs will be lost, UNISON stands by its assessment that 3,000 jobs are at risk. Councillors appear to be actively considering officials’ recommendations to ditch the council’s no compulsory redundancy policy. We note the council leader’s statement in the council meeting today that he expects officials to stick to council policies. This leaves UNISON wondering what is the chicken and what is the egg and whether or not the Capital Coalition of Labour and SNP have signalled to officials that compulsory redundancies may be acceptable. Councillors also appear to be considering privatisation of Facilities Management with alleged savings of £80 million. On the money front that seems far too good to be true. Surely senior officials and councillors will recognise that if something looks too good to be true, it usually is. It is worrying that the lessons of the ditched 2011/2012 privatisation have been lost. UNISON produced evidence upon evidence at that time where privatisation had consistently failed to deliver on promises, contracts were rarely on a ‘like for like’ basis and councils had to take contracts back in house at huge cost. Deep in the proposals is mention of adoption of an Enterprise Wide Strategic Partner model despite this being overwhelmingly rejected by councillors in 2011. UNISON led strong evidence including Audit Commission research that showed that up to 70% of strategic partnerships in the private sector fail, with few meeting expectations. Three of the earliest councils to adopt strategic partnerships terminated their agreements before their term, incurring additional costs. The research noted that some partnerships proved inflexible, hindering councils’ ability to respond to changing external circumstances. Crucially, the report pointed to the need to consider ‘other options to transform service delivery including reforming in-house provision’. 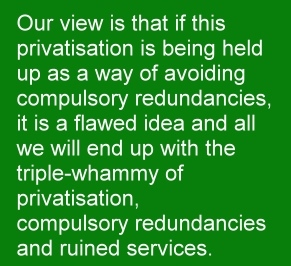 Our view is that if this privatisation is being held up as a way of avoiding compulsory redundancies, it is a flawed idea and all we will end up with the triple-whammy of privatisation, compulsory redundancies and ruined services. The continued drive by senior officials to introduce privatisation despite the council ‘presumption’ against privatisation is deeply worrying. Edinburgh needs to reaffirm its commitment to a public service culture and abandon the privatisation ‘solutions’ that have been so disastrous elsewhere. UNISON will examine all of the proposals in detail and continue to lobby against compulsory redundancies and privatisation. UNISON Edinburgh Branch members, in successive Annual General Meetings since 1998, have consistently demanded an industrial action ballot in the event of compulsory redundancies. That is a mandate that gives confidence that they would overwhelmingly vote for action in such a ballot. It is quite scary what is happening. The council should be seen as a leader in the market on standards, morality and integrity. If vulnerable services go out of house who shall lead and who shall follow. Is it, that we are now in a position where these values don't count any more as long as statutory obligation is met at the lowest cost possible. Everyone understands the need to make savings, cut waste, improve efficiency, but do we have to throw out the baby as well as the bathwater.